Hiab have for many years been one of the worlds great crane manufacturers. 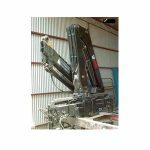 Nixons Wagga is able to supply both new and used Hiab cranes for a variety of applications. Our fully equipped workshop offers a full fitting service. Contact us for a great price on a crane to meet your requirements.